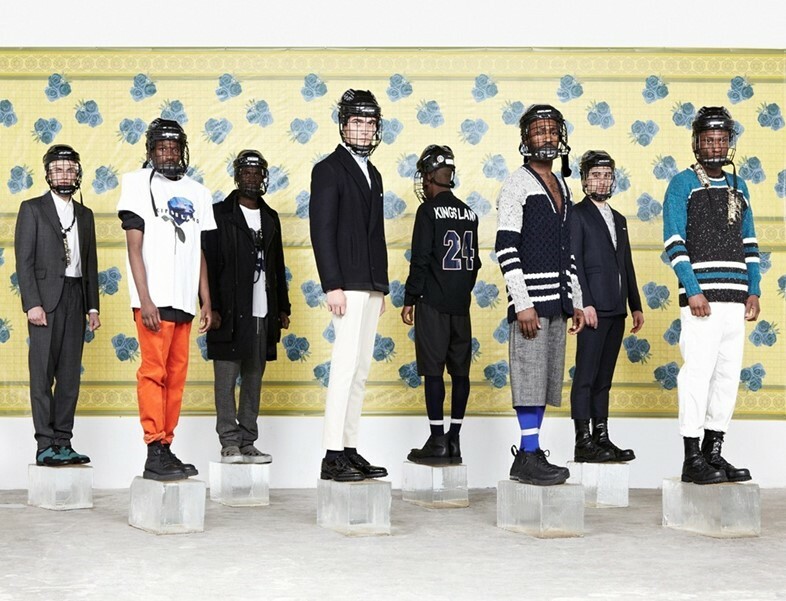 Our AW13 collection is based around The Kings Land Knights, a fictional ice hockey team inspired by our area in East London, where I grew up. 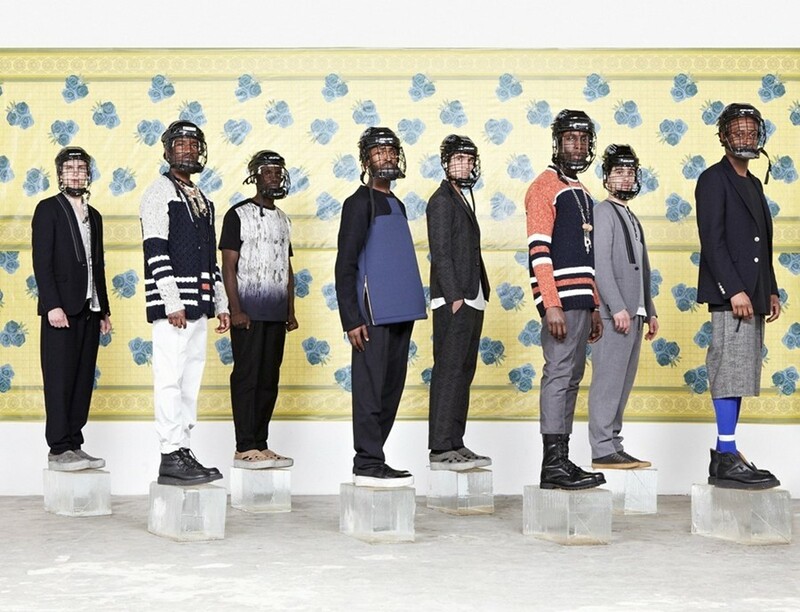 It centres around this idea of transculturalism, a concept we touched upon for SS10 where we were looking at elements from the Bangladeshi community around here, prints from the Turkish and African community, silhouettes from the suedeheads and signifiers from other cultures in the area. It almost doesn’t work, but we quite like the discordance. 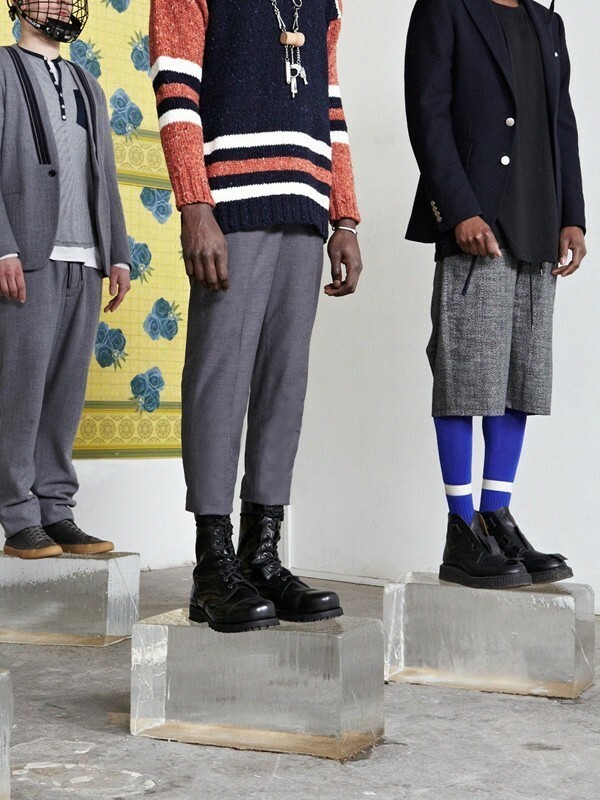 I guess there’s this idea of still retaining a sense of English oddness, because it feels authentic, and it’s relevant in terms of how people identify with culture and fashion as their own identity. I think music plays a strong part, for me, the reason I started taking an interest in design, the same reason my father did, was this idea of power of identity - how your clothes can come to define you and how people perceive you by what you’re wearing. For me, it’s about working out the codes that make London tribes so intangible to define. They are all a part of this weird hybrid that we called the Kings Land Knights. I guess in a sense, it is a pastiche, but at the same time, we’re trying to create a new language, where there are elements that many different people can relate to. I love the purity of tribes, where there isn’t necessarily an external influence, where there’s a purity. Because a lot of the London tribes seem quite affected and too self-aware, the feeling of a parochial tribe is really reassuring. I guess that’s why welooked to a lot of the the older communities that exist in the area. A lot of the young Bangladeshi ‘rude boys’ in the Tower Hamlets area, have the most incredible style – the most amazing haircuts and really clean cut looks. And if you try and find images of them online, it’s almost non-existent. They create their own identity that’s separates them from the more traditional generation before them that still live in the community I guess what fascinates me is just the way they’ve used their identity to define something - the difference from one generation to another, in the same way that classics youth-cult tribes always have. British youth has always used clothes to rebel against the establishment – and this seems like a sort of a similar ideal. The real hook for us with the ice hockey theme came from watching a lot of early 90’s hip hop videos and no rappers wore ice hockey sweats until a very specific point in time. There were no black professional ice hockey players in the early 90s, so for black rappers to wear an ice hockey sweat was quite a real statement. Whether it be American football, baseball or basketball - sweats became a language of identity for hip hop. And then my dad came across this website, where this guy had collated every YouTube video of every black rapper who’s ever worn an ice hockey sweat. And it was just fascinating for the both of us, the more we looked into it the more history, and the more interesting it became, and we realized that there was a little phase in the early 90s where this small group of rappers – including big names like LL Cool J – started to wear ice hockey sweats, as a protest, I guess, to make a statement. That really kind of set something off and where that element of reflection started, but we also wanted to combine this idea with that sense of an authentic British response to hip hop culture, which always had a distinct London accent. It’s not just the music, that’s what I find amazing about hip hop – it’s a culture in itself and that was an interesting thought for my dad and I as well. I guess the elements of Hip Hop have surpassed the barriers imposed on normal music genres, and people like A$AP Rocky have come to redefine what hip hop means for a new generation us. I think that’s something so significant. We listened to a lot of 90s rappers while making this collection, and some of the people who are actually more contemporary- discussinghow their identity and style has changed so dramatically, and what that means, and what they’re trying to repurpose. Our presentations are a reflection of our surroundings – what we’re trying to do is create a team or an army of men that felt like they represent what the brand is about. It’s not about colour at all, it’s definitely about an attitude that we were trying to convey. 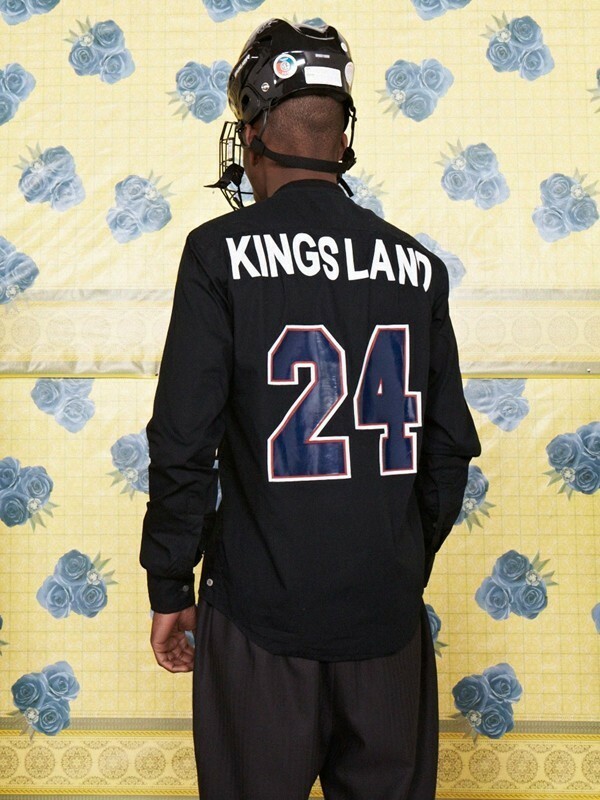 I think the Kings Land Knights is about the sort of strength and raw energy that emanates from London. Every collection we do is a conversation, I guess. It’s amazing to work with my dad because we come from two different generations who often experience the same thing in different ways. That dynamic creates another layer to what we’re doing and a lot of the time what you’re seeing is a conversation between father and son, and looking at culture, and how it affects both of us. My favourite thing is people watching, and I guess we’re trying to create a new tribe and a new language that represents our London.